Do you want speed or do you want adventure? A van from the beaches in Playas del Coco, Costa Rica, where we stayed a few nights, to the nearest airport in Liberia is about $50 per person. 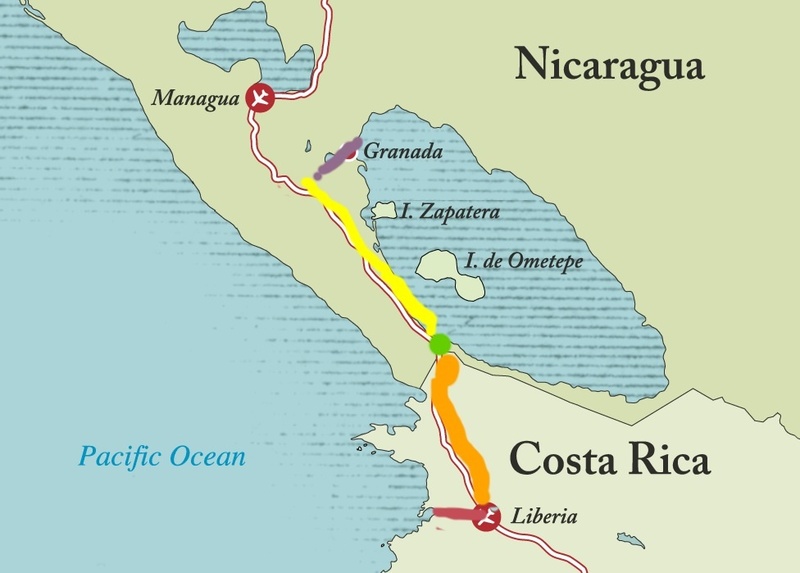 A flight from Liberia to Managua, Nicaragua – the nearest airport to our destination in that country is about $120 per person. A van from the beaches where we were staying in Granada is about $40. The route from Point A to Point B is not so easy sometimes. So for a mere $210 per person, we could have been here in a few hours. Or, for $21 apiece, we made it here in seven – laughing, sore and sweating the excitement from every pore. At 8:40 a.m., having already walked a rocky mile to the bus stop with our packs, a bag of snacks and the morning newspaper, we realized they were already cueing up for the rumbling 9 a.m. bus that wouldn’t be waiting around for it’s appointed departure time. We rumbled through the dust, thankful we’d decided to arrive early to be sure we were in the right place. $2. Packs on our laps. Of course, I complicated it by throwing open the paper to read and translate for Steve as best I could, the intricacies of the previous day’s national elections which had resulted in a hair thin advantage for a surprise candidate and will force a run off on April 6. In Liberia, we hopped from our seats and ran two blocks along an unpaved road to another bus station. 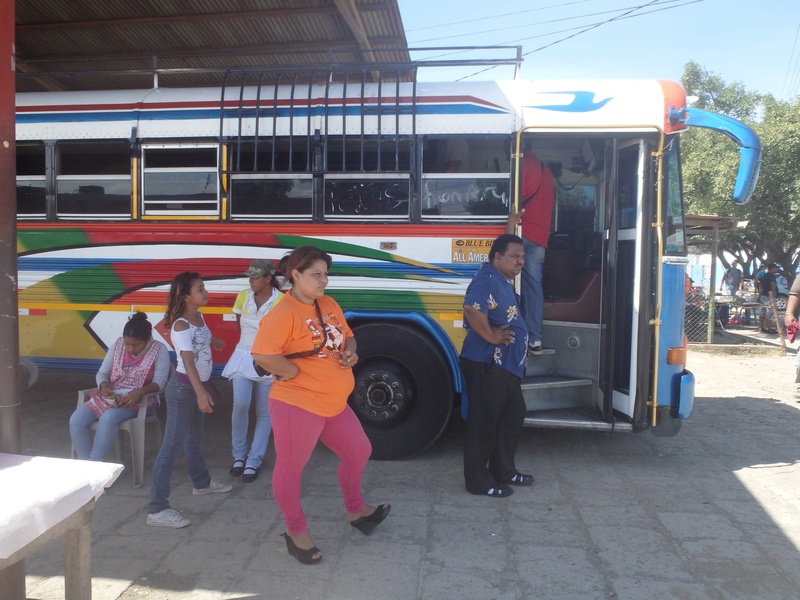 Weaving through the vendors, selling green mangoes, chances at untold fortune from an unofficial lottery, shoes and flavored water, we managed to ascertain the rattling silver bus in the second dock would get us to the border crossing in Penas Blancas. Four dollars each and it was leaving now. The driver crossed himself as he prepared to throw his rumbling vehicle into gear. Was he a pious man or was he just concerned about the safety of our passage? A couple of Americans seated in front of us are what the expats call “permanent visitors”. They have not established residency in Costa Rica, but they live and work there. Every 90 days, they go to the border, cross into Nicaragua, stay a day and then return with a new three month visitor pass. The couple took us under their wings and at the Costa Rican side, helped us find forms and directed us to the appropriate set of windows to present our papers and passports for stamping. Outside on the grey road, dust and leaves danced around us. A chain link fence, topped with barbed wire lined the path. This is No Man’s Land. Not Costa Rica, not Nicaragua. Police from both countries idle along the side of the road. No one expects trouble. Everyone is prepared for it. There is no sign announcing your arrival in Nicaragua. On this corner, you’re in no country at all. Across the street, there are Nicaraguan government offices…that’s how you know. There, entrepreneurs offer to help you – for a fee – with getting forms that are readily available from the officials in the kiosk. For a little more, they will translate the forms, clearly printed in both Spanish and English. 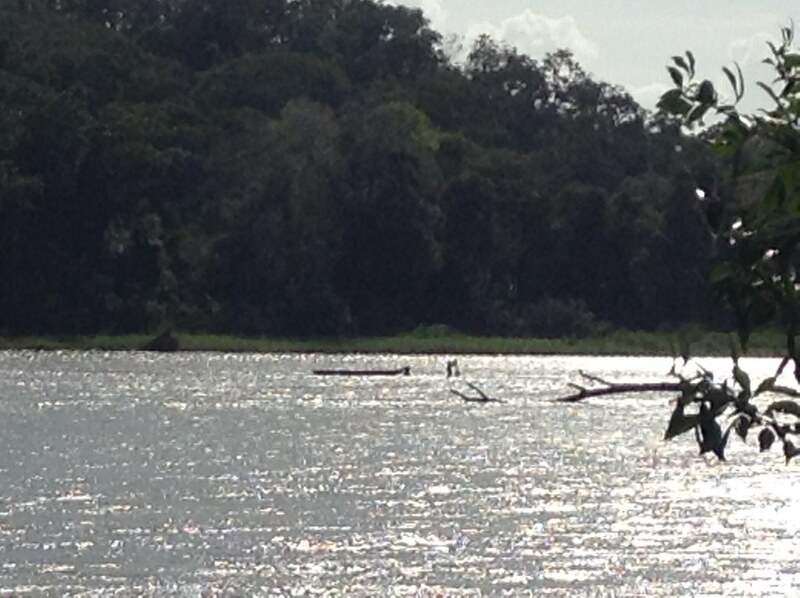 In fact, it is the EXACT form you filled out on the Costa Rican side of the border. A look at the passport, with barely a glance to see if the photo and the presenter match and you’re on your way with your papers. A dusty parking lot, loaded with hawkers of everything from homemade cookies to fried chicken, from $5 leather sandals to crocheted hacky sack balls. And buses. “Eso bus para Granada?” “No. Diez minutos…aya…” (Does this bus go to Granada? No. In ten minutes…over there…) Our Spanish is improving, but the vague wave of the driver’s hand is not a clear indication of the exact location of over there. A few more attempts with similar results. Finally, an older gentleman, with no apparent connection with any of the buses, points us to a gate in the blue wall. People are pushing in and out, crumpling through in no apparent order. One, and occasionally two officials flipping carelessly through their papers. We push through and are spit into a cacophony of colors, smells and sounds. It’s the beauty and chaos that precedes the rehearsal of an opera, loud and splashed with seemingly unrelated sensory offerings. We get on a bus, painted with wild colors and Biblical verses. He says the bus is going to Managua, but it will leave us near Granada. Near? What does that mean? A hand painted verse will protect me. God does protect children and fools. We will be fine. The man who had lured us onto the bus had quoted us 10 American. The posted sign was an amount just under $6. I paid in Cordobas for the lesser price. The ride along tree lined paved roads is beautiful. 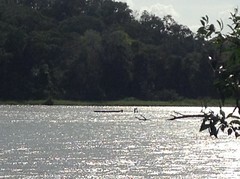 To our right, Lake Nicaragua – an inland sea – lined with volcanoes, some of them still active. To the right, heading south, are buses, ox-drawn carts, horses, cars and motorcycle cabs. A vendor on the bus plops his cooler in the lap of another passenger. He fills a tortilla with sheets of fetid cheese, a mystery meat and natilla, a sort of salted sour cream. People are buying up the smack. We pass. Finally, the bus stops at a fork in the road, a grassy median filled with red cabs – three-wheeled motorcycles with a canopy over the bench seat perched in the back. “Go here to Granada,” the driver called back, laughing at our previous skepticism. We tumbled out. A cab driver quoted us $20 for us and a young man who was also seeking a ride. $20 for the three. His competitors said the same. What choice did we have on this grassy island on the Pan American Highway. 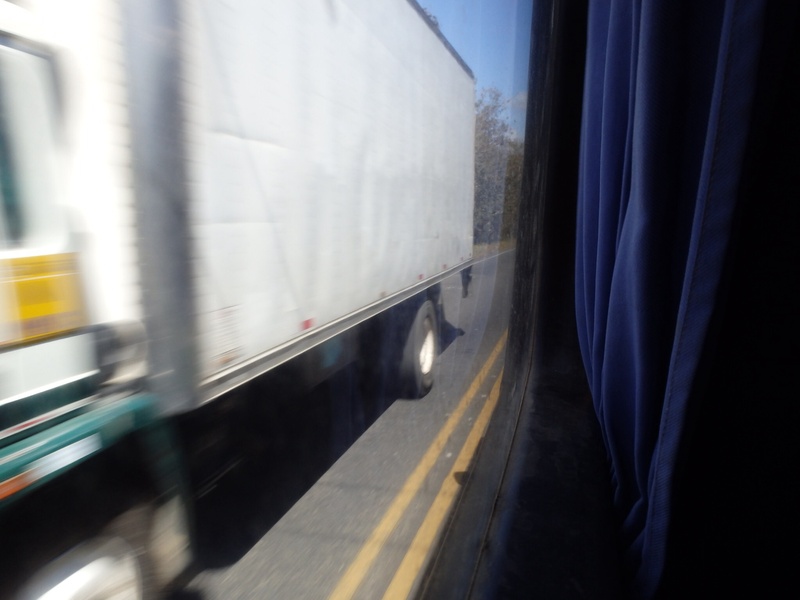 We jostled along the semi-paved road, crushing against the sides of the cab. Bump. Push. The cab sputtered, occasionally stalled, but never stopped until we reached town. “GM Granada Hostal,” we told the driver. He stopped in front of the luxury Granada Hotel. “No, the hostel.” He shook his head. The bellhops at the hotel shook their heads. We paid the driver and thanked him. A quick Skype call to the hostel brought an eager employee on foot, who led us on a wild run through the cobblestone streets and alleys to our destination. Exhausted, we dropped our bags. A bed never looked so good. 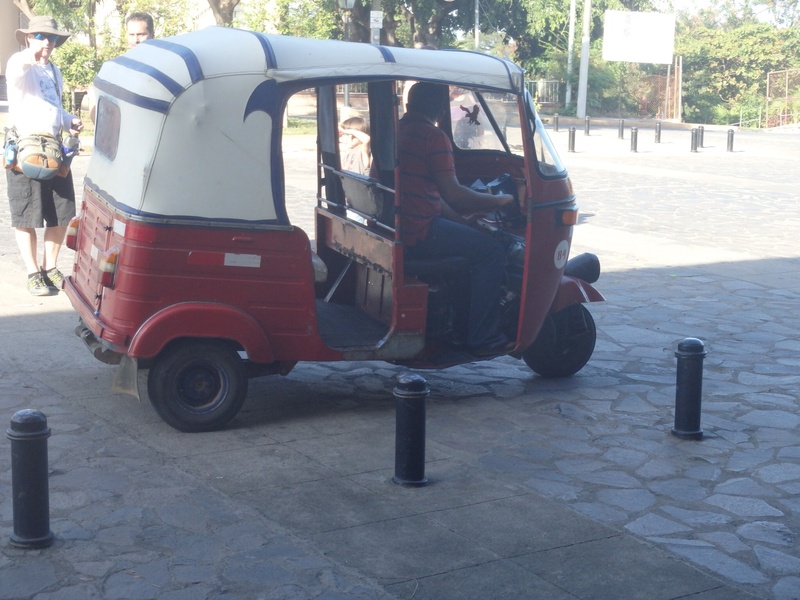 This entry was posted in All posts, Budget, Getting around, Granada, Nicaragua, Vicki "Mamita" Barnes. Bookmark the permalink. I love this! It is absolutely the way to go. I am so jealous of you all getting to go do this, but so happy for you both!